I have been pushing and you have been supportive. And I thank you. On the day before Father’s Day, I will make one final case for why this app is so special and why I believe it is the best thing you could ever get for the dad in your life. Because what you’re giving is not an app – you are giving unforgettable memories. I speak from experience. In creating this app, Alex, Jack and I spent countless hours testing these things out – and to me, my boys, and my wife – this testing was a magical experience. Jack peed his pants twice from laughing so hard, Alex found someone’s wedding ring with a metal detector, I threw out my back throwing a watermelon, and through all of it we created memories of having epic fun together. I hear the same from other families that tested out activities. The Demottes brought donuts to a fire station and ended up getting to slide down the poles. The Beatties played Tron in their front yard with glow sticks and Frisbees and the kids still talk about it. The Verderames made a monument out of popsicle sticks that listed all the special things they’d done that summer. I believe my kids will tell stories about these activities when they are grown ups themselves. Maybe they’ll do some of these things with their kids – who knows? And THAT is what you are really buying when you spend $2.99 for this app. Think of it this way: Take your kids to a movie, you will spend $40, and a month later what you and your kids will remember is that movie. You won’t remember that you did it together. Buy this app? You are your kids pick an activity, put down the device, and you go out and create unforgettable fun. Think of your best memory with your own father – it’s not a movie or a trip to Chuck E. Cheese – it’s a time you did something together. This app has things for inside and outside. It has stuff for zany dads, athletic dads, and shy dads. There are things to do one on one, and things you could do at birthday parties with 20 kids. Talk to someone who has grown kids and they invariably say: “Enjoy his time – it goes quick.” I have found that to be true. So here is my final sales pitch to you, but really it’s not a sales pitch at all. It’s advice – some of the best advice I’ve got. You cannot give a dad or a kid anything better than a fun time together that they won’t ever forget. And with Kid Dad Fun – you get 101 of them. 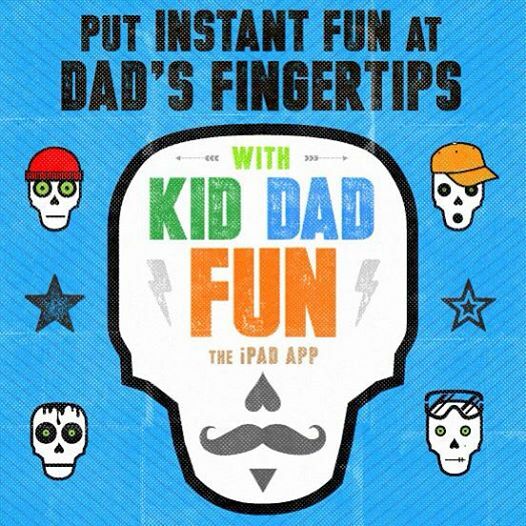 DOWNLOAD KID DAD FUN NOW!